Libertyville, IL - The St. Sava School of Theology in Libertyville, Illinois Student Alumni held their third annual reunion on November 5-6 2007, under the auspices of the Alumni Association which is celebrating its fifth year anniversary. The reunion began, as it traditionally does, with the Vespers service, served by the alumni president V. Rev. Aleksandar Vlajkovic. The seminarians sang the responses. Following the dinner and the greeting from the alumni president, Fr. Mile Subotic, the organizer of this event, introduced the guest lecturer George Bebawi, Ph.d.
Dr. Bebawi is the professor emeritus of Cambridge University. 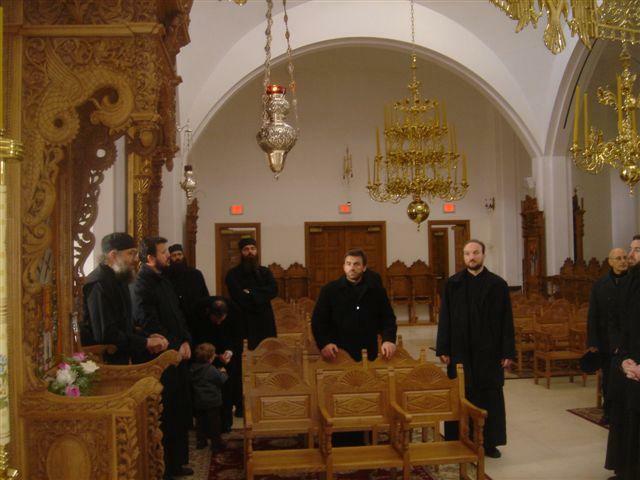 For a number of years now he has been living in Indianapolis, Indiana where he actively supports the local Orthodox parishes. Born in Cairo he was a member of the Coptic Church before converting to Orthodoxy, Dr. Bebawi has lectured for many years in the Middle East and was a representative in the World Council of Churches and member of numerous delegations which took part in ecumenical dialogue. The theme of his lecture for this occasion was: “Does the Ecumenical Council in Chalcedon Divine or Unite?” In his lecture Dr. Bebawi paid particular attention to the results of Nestorian’s teaching as well as his influence on Muhammad, the appearance of the Koran and Sufism in Egypt. The professor emeritus spoke in detail about the history of the Oriental churches, their dialogue with the Orthodox as well as their state in today’s Middle East conflicts. Throughout the lecture the accent was on the Chalcedonian significance of the person of Christ in two persons of His incarnation. A long and lively discussion followed the lecture on various themes. Particular attention was paid to the professor’s experience in the unsuccessful dialogue with Pope Paul VI and John Paul II, during which time the professor served as representative of the Moscow patriarchate. 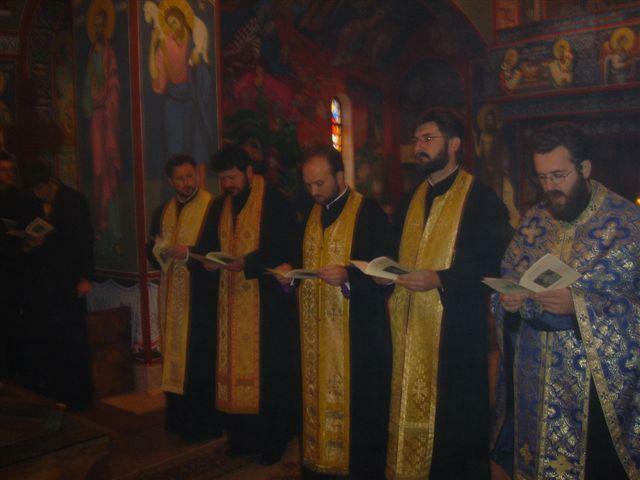 The second day of the Alumni reunion began with Matins, the Akathist to St. Nikolai of Zicha served immediately afterwards with the theological students singing the responses. 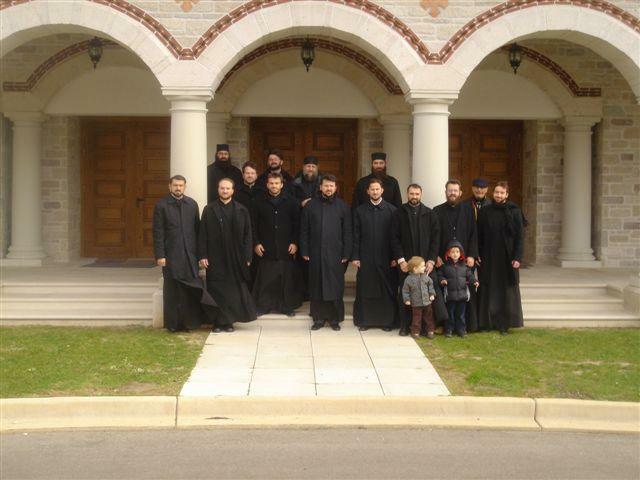 Afterwards the alumni visited the St. John Chrysostom Greek Orthodox Monastery near Kenosha, Wisconsin where they were welcomed by Fr. Chrysostom, the spiritual father of the monastery, who led them on a tour of the beautiful monastery property. Fr. Chrysostom is a spiritual child of Elder Ephraim who is most responsible for the reviving of monastic life in America, having built 17 monasteries in this country. Fr. Chrysostom spoke, as Abbess Melanija did later, of the contemporary miracles which are occurring and particularly those that occurred during the construction of the monastery. In this monastery there currently twenty sisters led by Abbess Melanija. Following the lunch that was prepared for the Serbian guests, the alumni returned to St. Sava Monastery and the two day Alumni reunion came to a close.